You see, Mike Tice’s son was a backup quarterback on Wisconsin’s roster in 2011 when Russell Wilson was in Madison, and it was there that Tice fell in love with Wilson. Former Wisconsin coach and current athletic director Barry Alvarez told Sports Illustrated all about Tice’s efforts to get the Bears to draft Russell Wilson as Cutler’s potential successor. 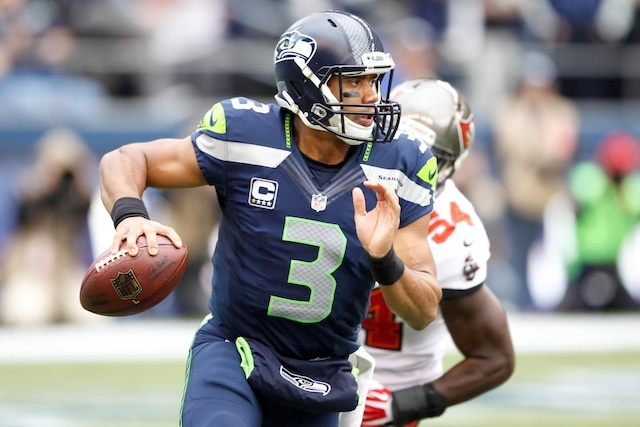 Russell Wilson would be taken in the third round of the draft, the 75th pick overall, by the Seahawks. The Bears made two picks before Seattle chose Wilson in the third round, taking Shea McClellin in the first round and Alshon Jeffery in the second round. They would take safety Brandon Hardin four picks after Wilson was selected, and Hardin was so good that he couldn’t even stick on a roster that opted for players like Chris Conte, Major Wright and Craig Steltz instead. Now let’s imagine the Bears had listened to Tice, and upon seeing Wilson fall to the third round they decided to package some draft picks to move up in the third round and take Wilson. The picks the Bears could have traded they instead used on Evan Rodriguez, Isaiah Frey and Greg McCoy. I don’t think we’d be missing any of those guys had the Bears traded the picks they used to grab them. So now we’re in a bizarro universe where the Bears drafted Russell Wilson to backup Cutler, and instead of Jason Campbell and Josh McCown filling in for him the last few seasons when he was hurt, it was Russell Wilson. Imagine Russell Wilson’s talent in Marc Trestman’s system. Now, I want to be clear. This isn’t sour grapes or blaming the Bears for doing something every other team did in passing up a chance to draft Russell Wilson. I just think it’s hilarious that Mike Tice, one in a long line of offensive coordinator mistakes under Lovie Smith, could have changed the future of the franchise had Lovie and Phil Emery listened to him. I think it’s safe to say that Cutler would be on his way to a huge paycheck somewhere else, and the Bears would be heading into the future with Russell Wilson as their franchise quarterback if they had. This entry was posted in Chicago Bears and tagged Alshon Jeffery, Jay Cutler, Josh McCown, Lovie Smith, Marc Trestman, Mike Tice, Phil Emery, Russell Wilson, Shea McClellin by Tom Fornelli. Bookmark the permalink.